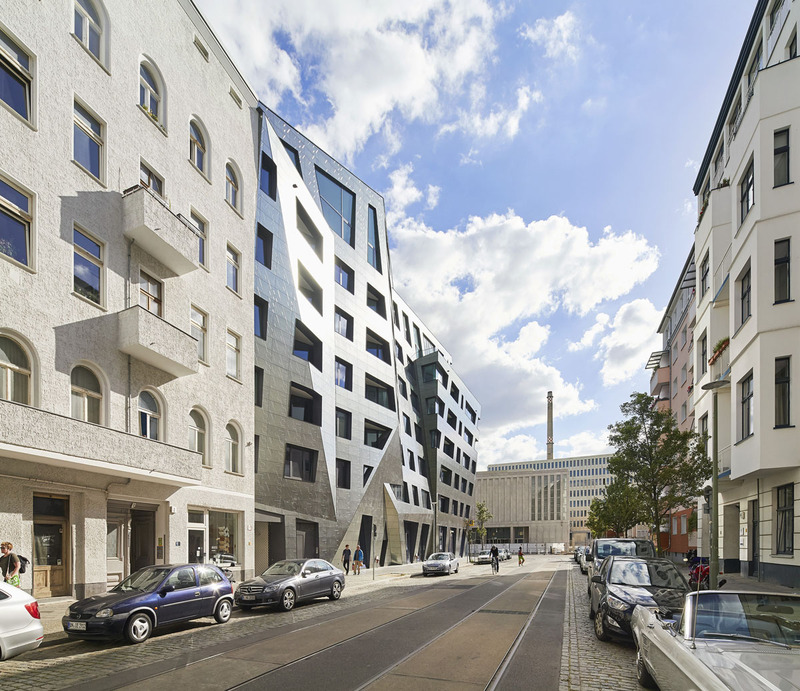 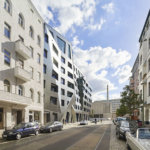 This direct commission in Germany brought Daniel Libeskind back to Berlin for his first residential project in the city. 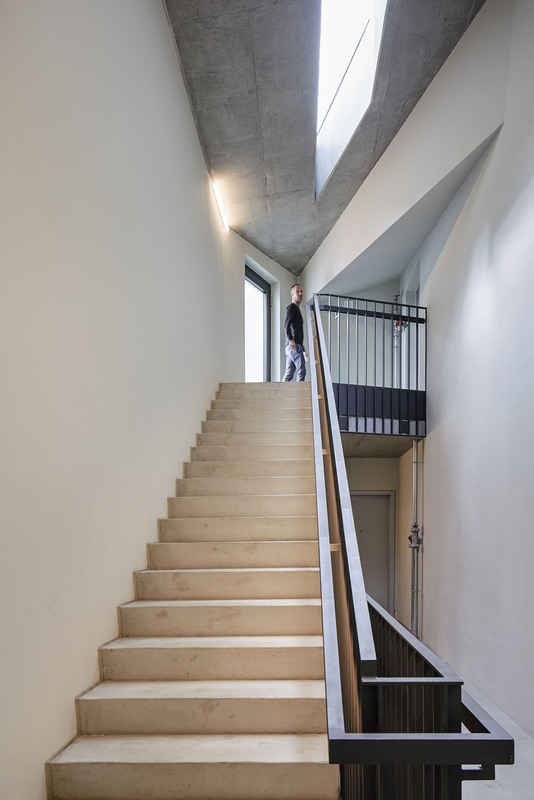 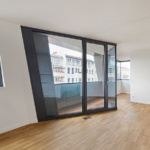 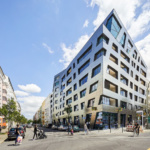 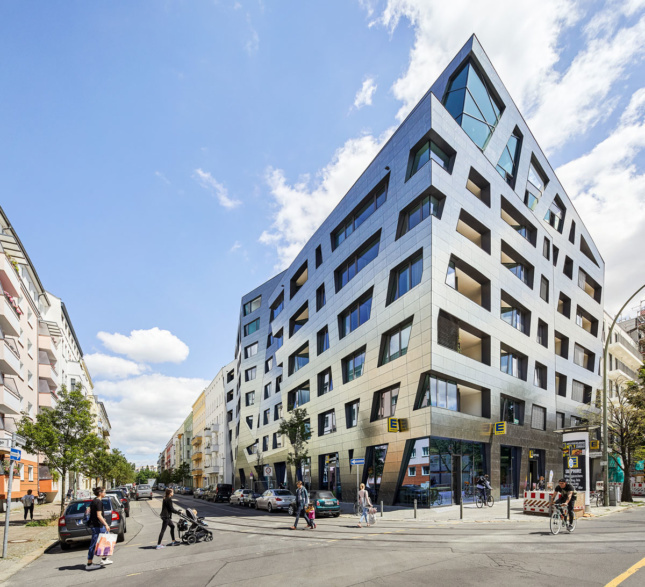 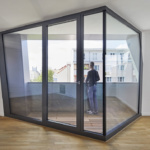 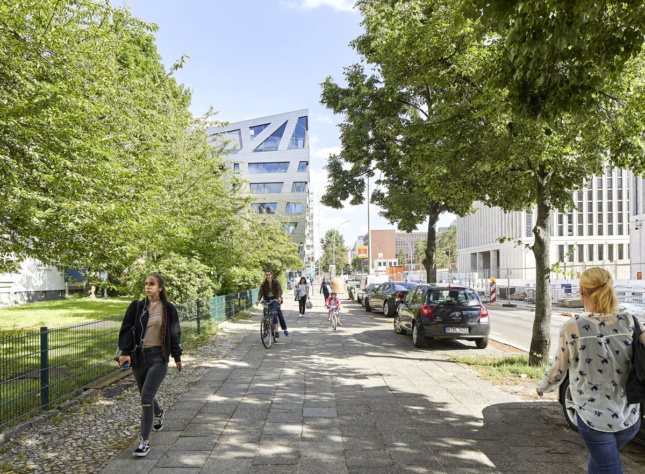 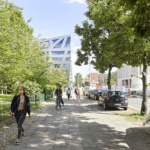 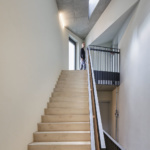 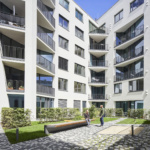 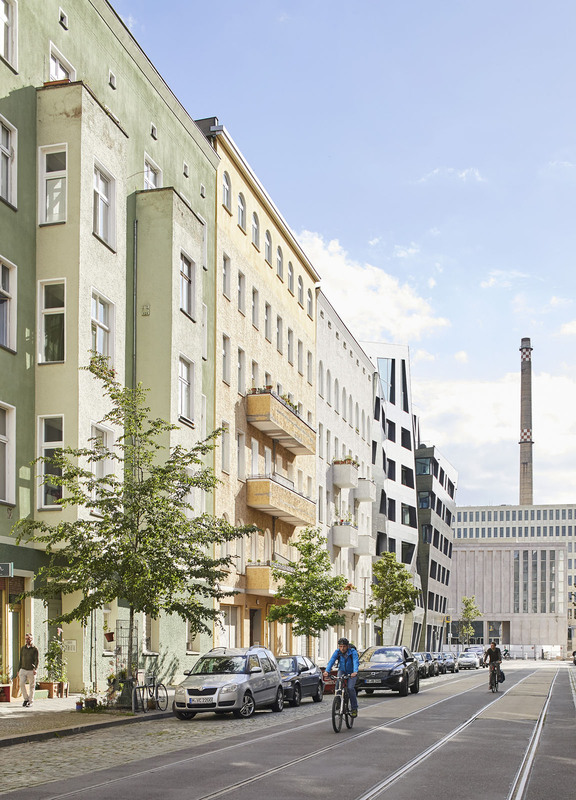 The project, located on a busy corner in the Mitte neighborhood in central Berlin, presented a design challenge: How to carve out 73 desirable one- to four-bedroom apartments on a plot measuring a little less than half an acre? 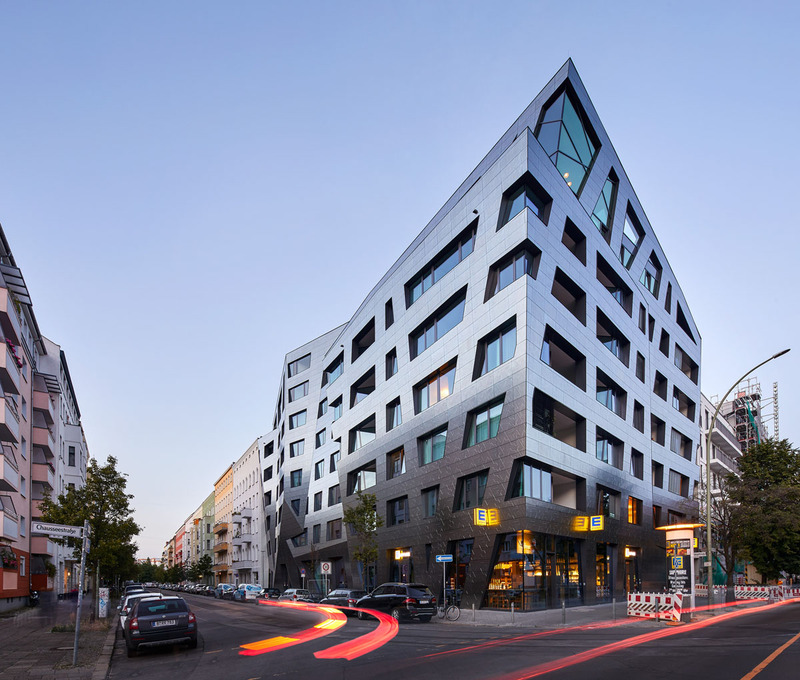 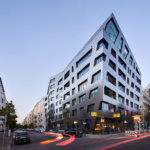 The result is a faceted mid-rise building that negotiates Berlin’s zoning code with varied setbacks, angular windows, and canted walls. 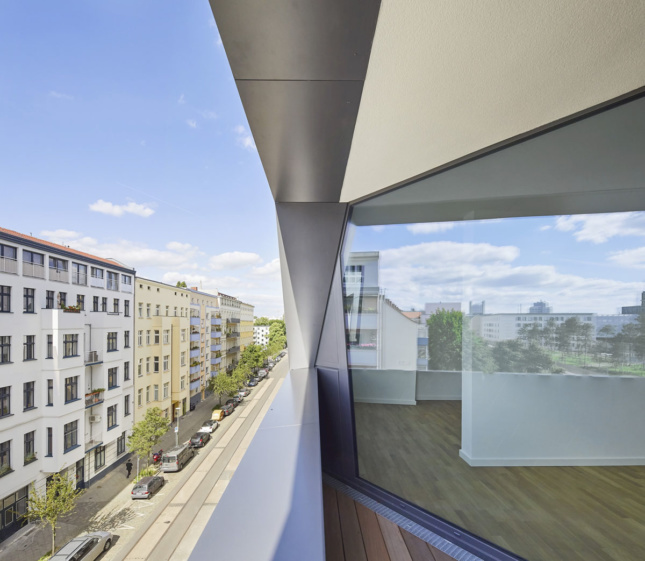 In select locations, the building envelope subtly pulls away from the primary facade, creating intimate outdoor balcony nooks. 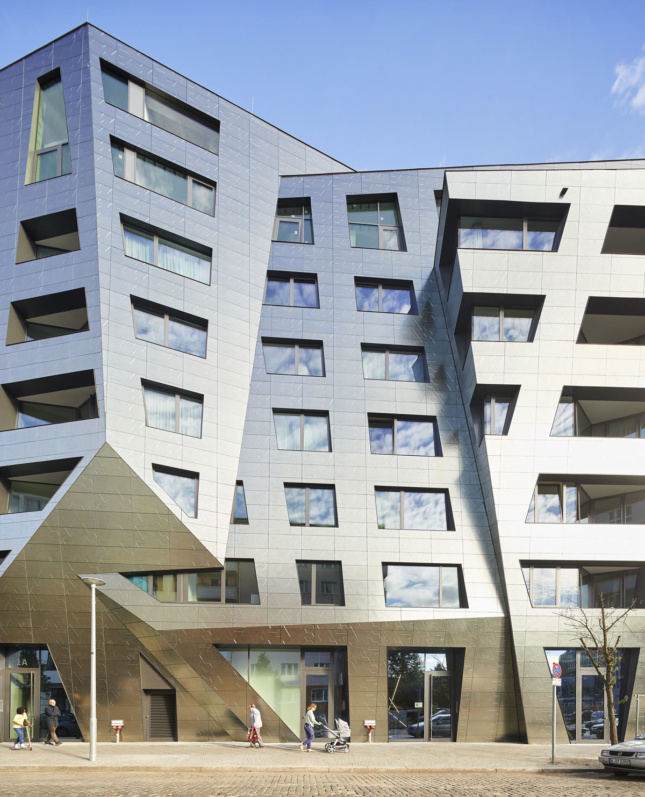 Stefan Blach, principal at Studio Libeskind, said the balconies not only give the facade more depth but also enhance the quality of the units. 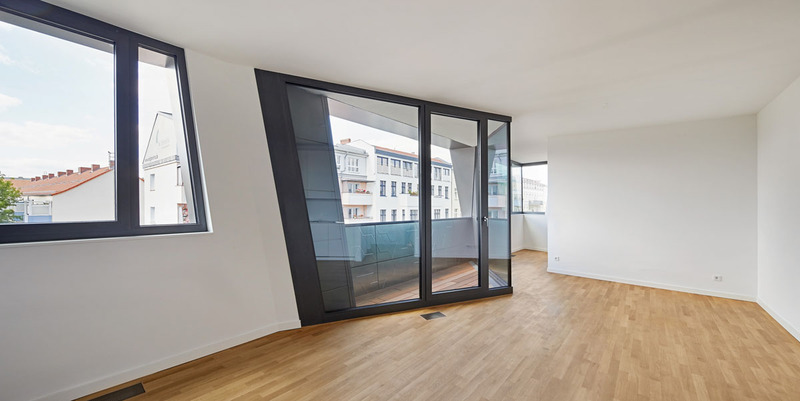 “There are 70 units, most of which are very small, and even those have a balcony that wraps from the living room to the bedroom. 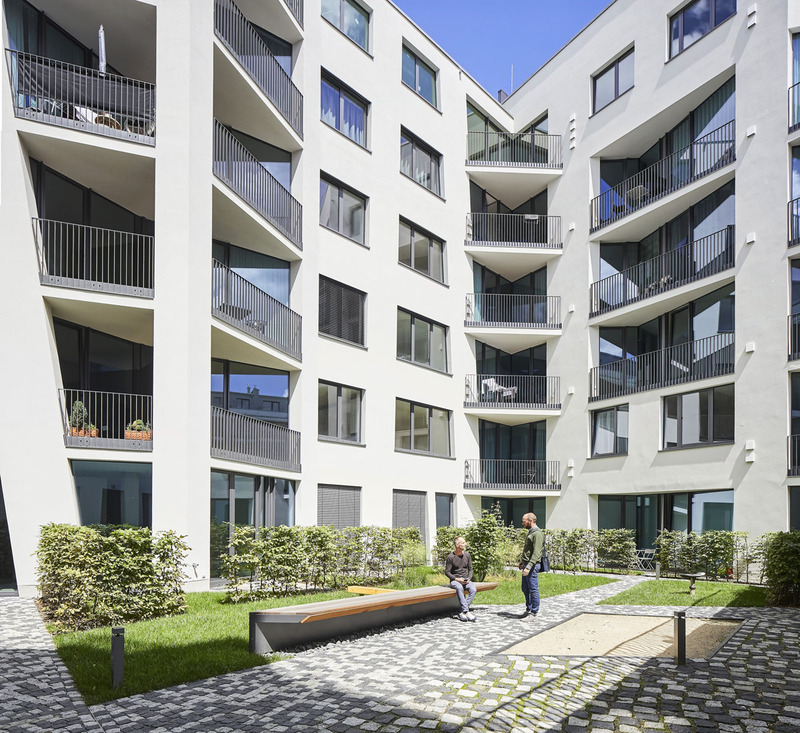 A lot of work went into developing these units—each plan is unique. 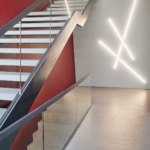 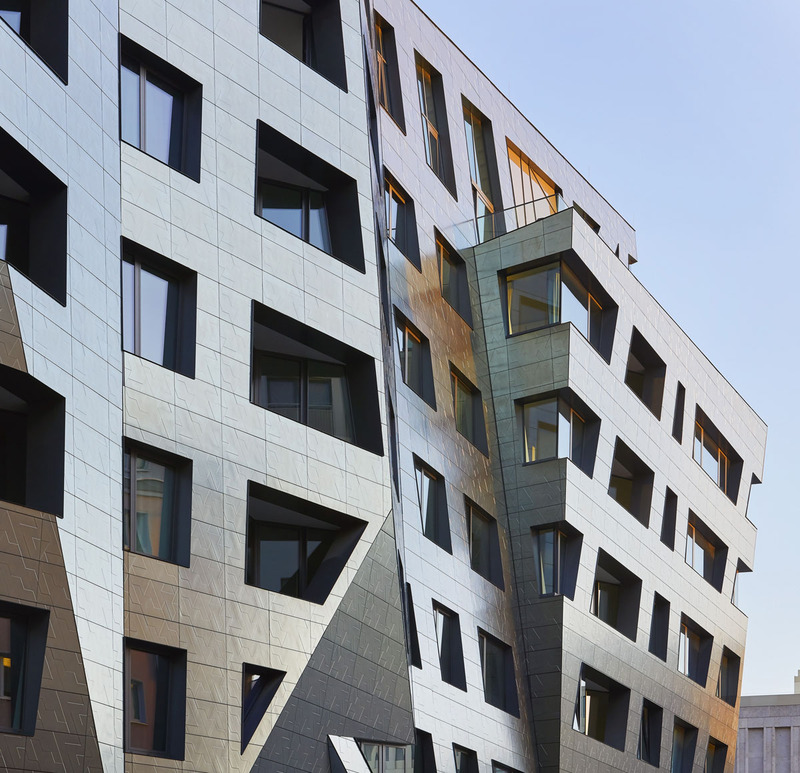 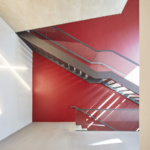 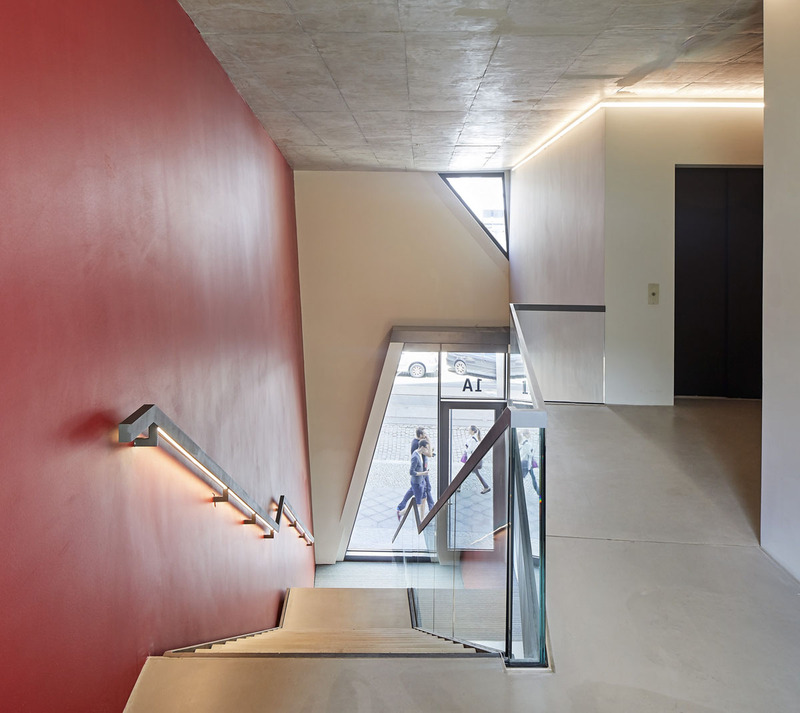 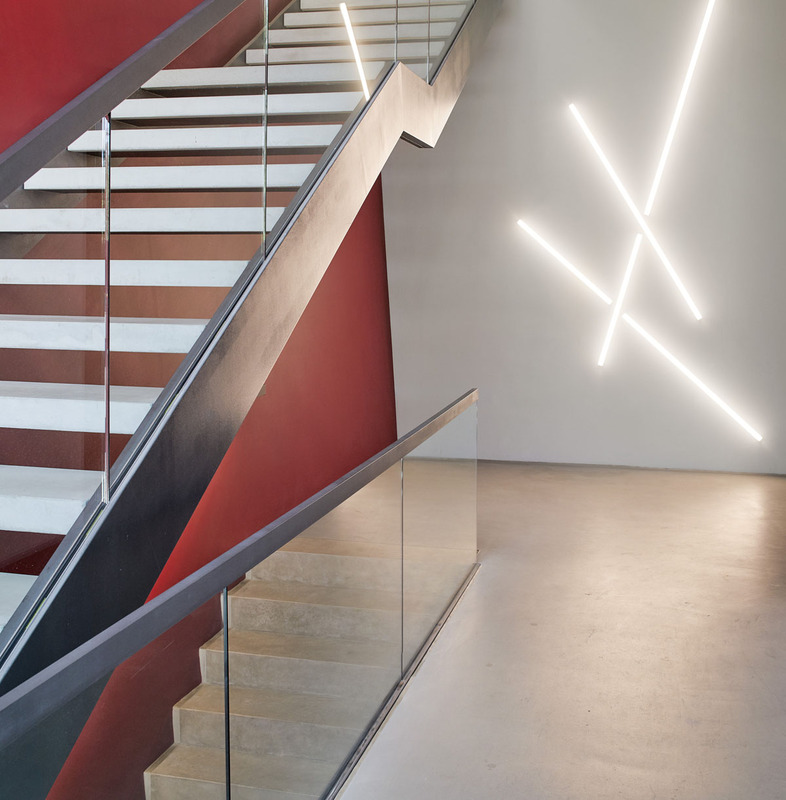 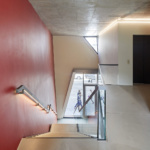 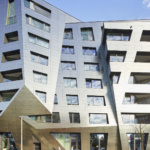 The coordination between facade and plan was really special in this building.” The project is a showcase for Libeskind’s signature tile design, which wraps all of the street facades and as well as some key interior moments. 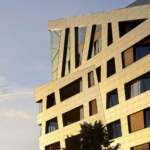 Produced by manufacturer Casalgrande Padana, the three-dimensional geometric-patterned stoneware tiles, named Fractile, measure approximately two-feet by four-feet and feature unique advanced technology to self-clean and aid in air purification. 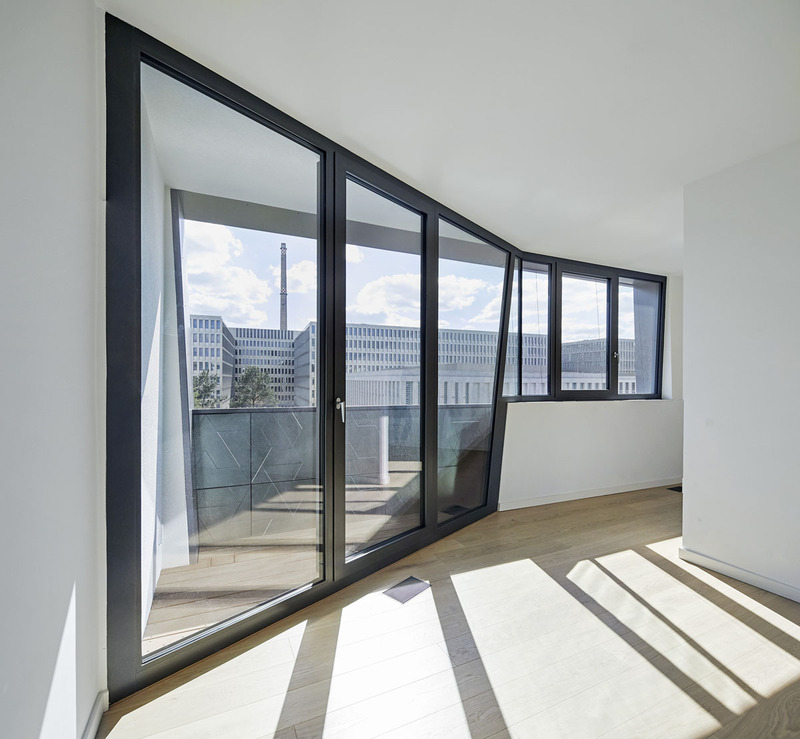 This is achieved by the application of a specialized titanium dioxide coating that breaks down organic deposits when exposed to the Sun’s UV light. 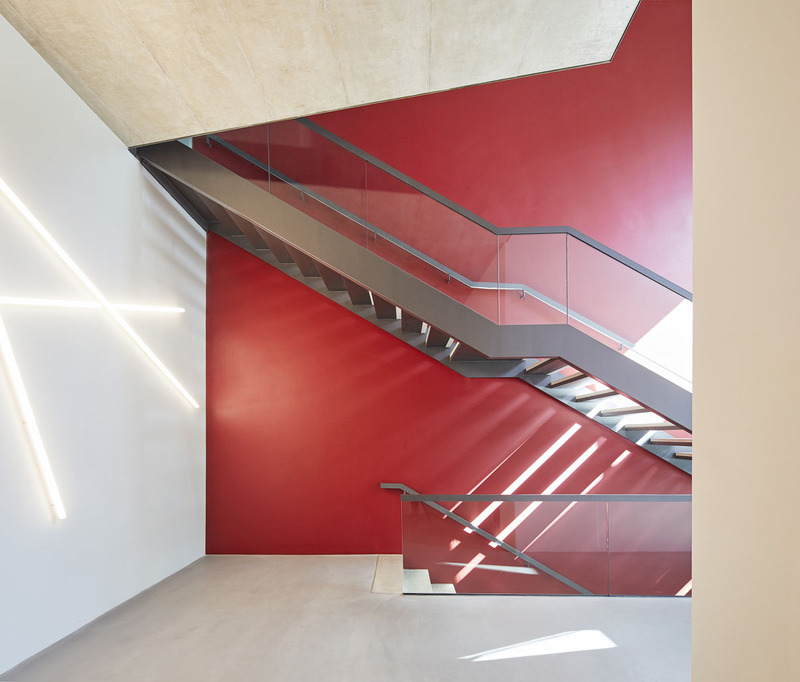 The coating is the result of a master agreement signed between Casalgrande Padana and TOTO, a global leader in photocatalytic technology. 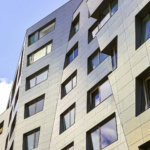 Fractile is part of Casalgrande’s ongoing efforts to produce bioactive ceramic products capable of interacting with the environment. 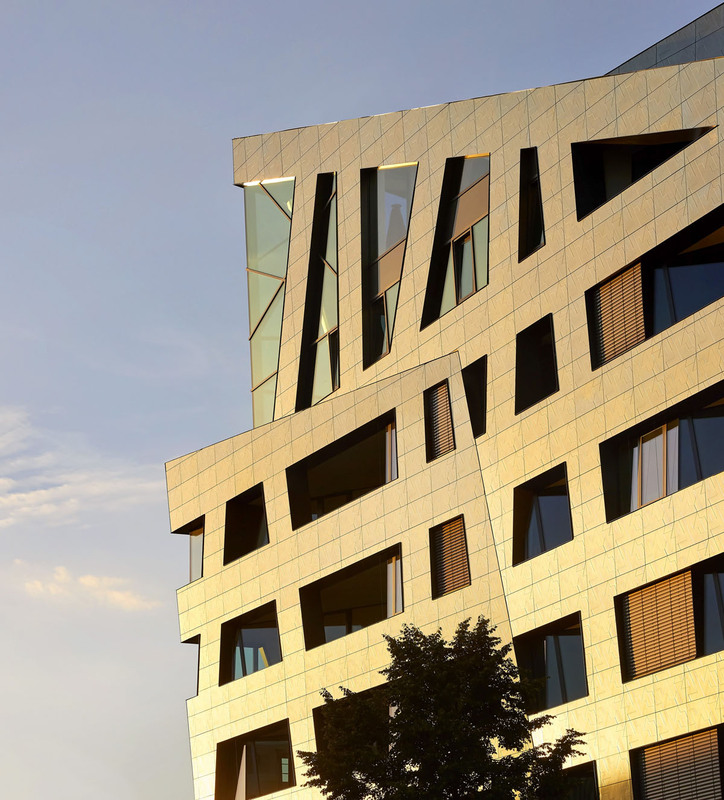 Of the 3,600 tiles supplied, only 500 were made in a standard production format. 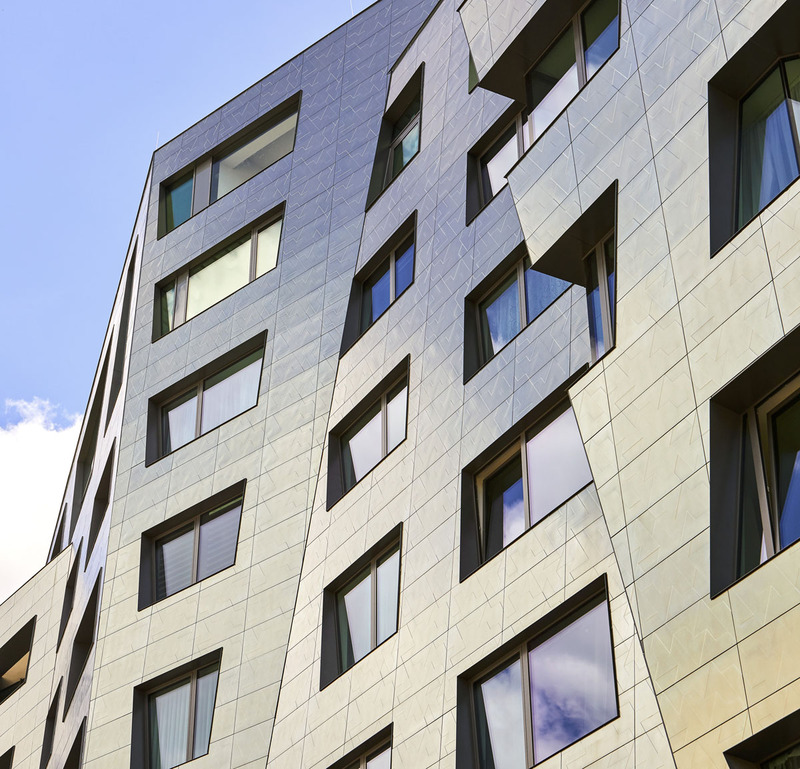 The remaining 3,100 tiles are custom shapes made using controlled linear and water jet cuts according to precise drawings. 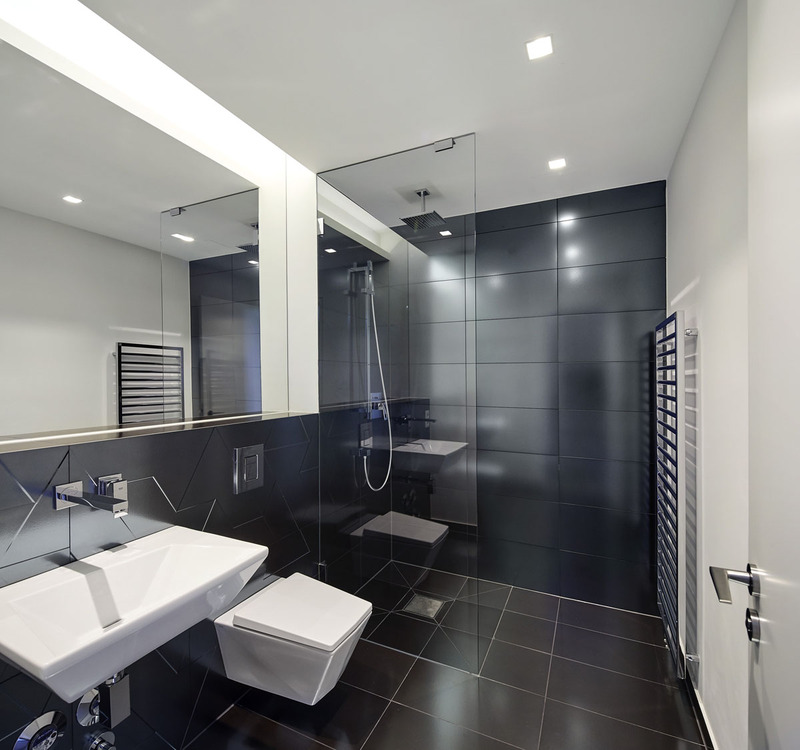 Additionally, every tile was specifically positioned to reflect the A or B sides of the pattern (the two positions of the tiles when rotated by 180 degrees). This specificity allowed the architects to control the overall patterning and reflective effects of the facade. The tiles were delivered in 15 different batches to the site and, due to the complexity of the order, each piece was identified with a unique number to ensure they were correctly positioned. 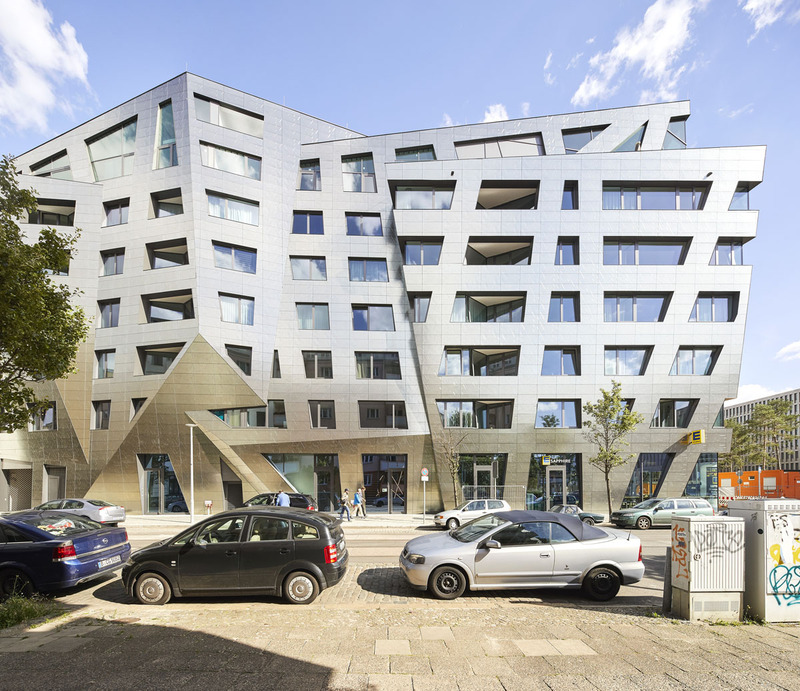 The delivery of the tiles took nine months, with installation taking an additional four months—an outcome that the manufacturer called “high satisfactory, given the parametric complexity of the shapes that needed covering.” The ventilated facade was assembled utilizing a standard anchorage system from Casalgrande in combination with micro-anchors from KEIL. 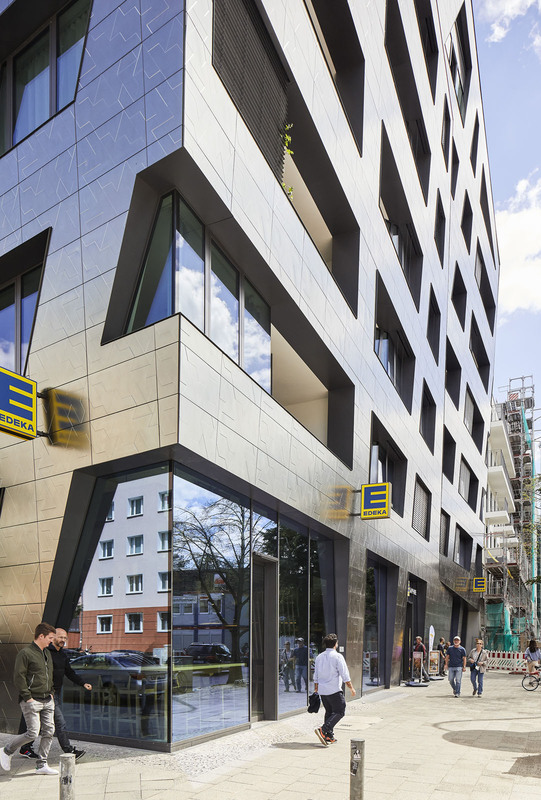 The facade has been built by general contractor PORR Germany and specialized facade consultant Medicke Metallbau. 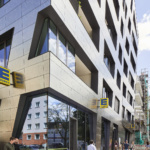 The building had to adhere to the 2013 EnEV energy code, one of the most stringent codes in the world. 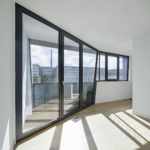 This limited the quantity of glazing in the project and, in response to the code, the project team specified high-performance triple-glazed units with external louvers. 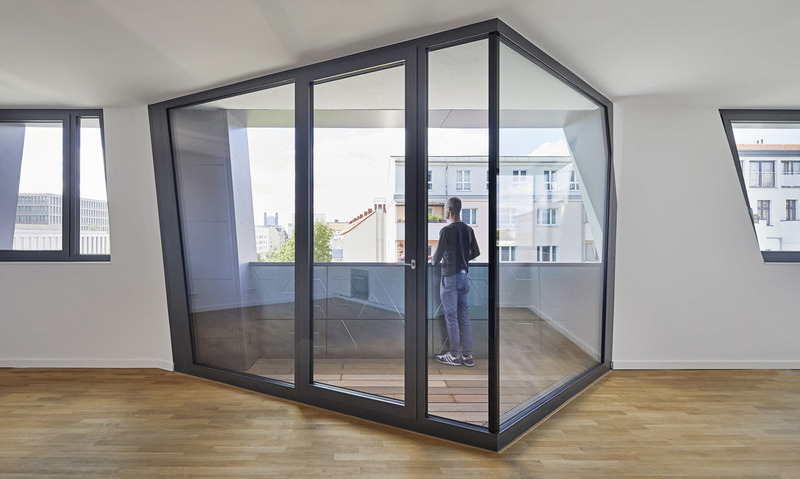 Operable units conform to a standard dimension, while fixed panels absorb irregular geometries of the facade. Another regulation relates to the oriels, which are not allowed to consume more than one-third the overall length of the facade, and are limited to a projection of around five feet from the building. 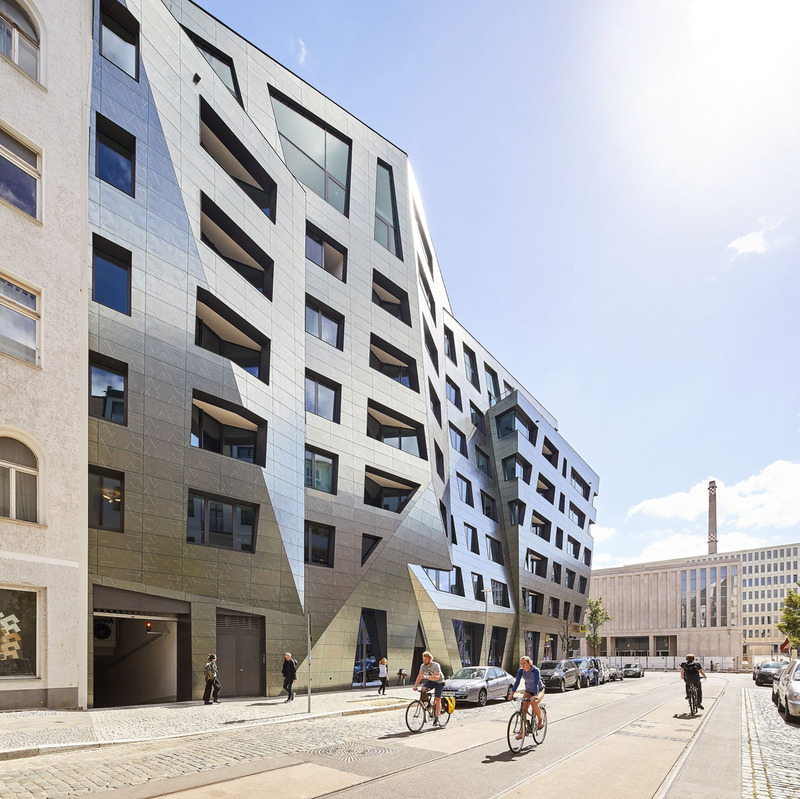 In the case of Sapphire, an agreement with the city allowed to the architects to cantilever a freeform volume of space over the sidewalk beyond the plane of the primary facade.